Project Data:JeHN Engineering has an excellent aptitude for high density multi-family development projects. 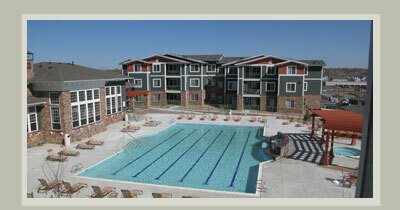 The Westward Look Apartment project was a perfect match for our skills and extensive experience in the City of Arvada. This development of 13.6 acres for high density residential use was not straight forward. The project scope included annexation and re-zoning of the site to allow for the proposed land use and density. Site design challenges included grading of the proposed high-density development on a site with steep topography while still meeting ADA standards, re-alignment and piping of an existing irrigation ditch, design of a bridge and UDFCD drop structure within the improved Van Bibber Creek channel, and the submittal of a CLOMR for the bridge structure.